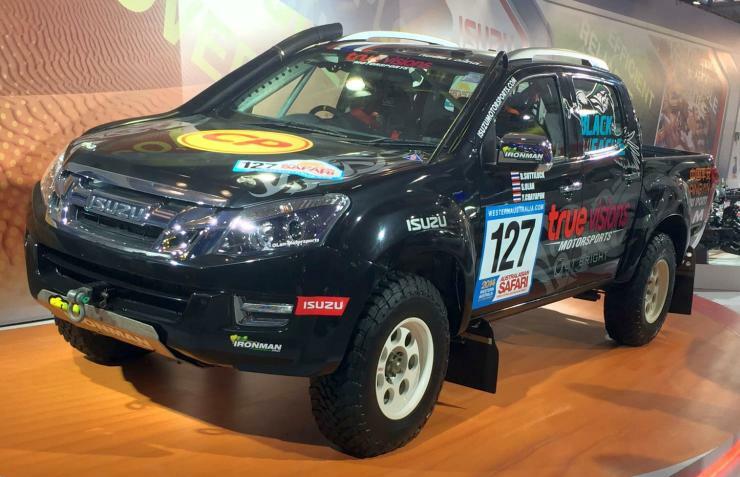 Japanese utility vehicle major Isuzu has unveiled the D-Max V-Cross at the 2016 Auto Expo. The V-Cross is essentially a D-Max that is aimed at the lifestyle pick up truck buyer. So, it’ll take on the likes of the Mahindra Scorpio Getaway and the Tata Xenon 2.2. The vehicle will be produced from the automaker’s spanking new Sri City factory situated on the Tamil Nadu-Andhra Pradesh border. The new launch will also push into the personal utility vehicle segment, which the Japanese automaker hasn’t catered to so far. So far, the D-Max sold in India could be registered only as a commercial vehicle. The V-Cross will change this. The new, twin cab pick up truck features a 2.5 liter turbo diesel engine with 132 Bhp-320 Nm outputs. A 5 speed manual gearbox is standard, and so is a shift-on-the-fly 4X4 transfer case. The new features that distinguish the V-Cross from the regular D-Max include a new front end with double barrel headlamps, 16 inch alloy wheels, chromed wing mirrors and door handles, a higher ground clearance, steering mounted audio controls and a 7 inch touchscreen infotainment unit. The vehicle is likely to carry a price tag between 8.5-9.5 lakh rupees, ex-showroom Chennai.